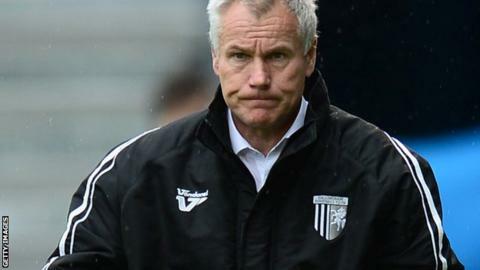 Gillingham manager Peter Taylor has criticised Swindon boss Mark Cooper for his celebrations in Tuesday's 2-2 draw. Robins boss Cooper apologised for his reaction after a last-minute own goal by Gills keeper Stephen Bywater led to an altercation on the touchline. Taylor was "amazed" to be sent to the stands after the incident and said he would be "staggered" if he faced a ban. "Mark over-celebrated and he said something. I was disappointed with that," Taylor told BBC Radio Kent. "There's a way to behave on the bench. We're all League managers and involved with an association." Bywater's mistake meant Swindon snatched a point at the Priestfield Stadium just as Kortney Hause's 51st-minute goal had looked like giving Taylor's side three points. Taylor insisted he was sent off after merely trying to defuse a row between Cooper and Gills assistant manager Andy Hessenthaler. Cooper subsequently told BBC Wiltshire: "Emotions were running high and there were a few words exchanged. When you score that late you tend to celebrate with too much gusto. "There was no malice in it from our point of view. If I've offended him [Taylor], then I apologise."